What is carbon neutrality and what rules do we need to play by in order to attain it? 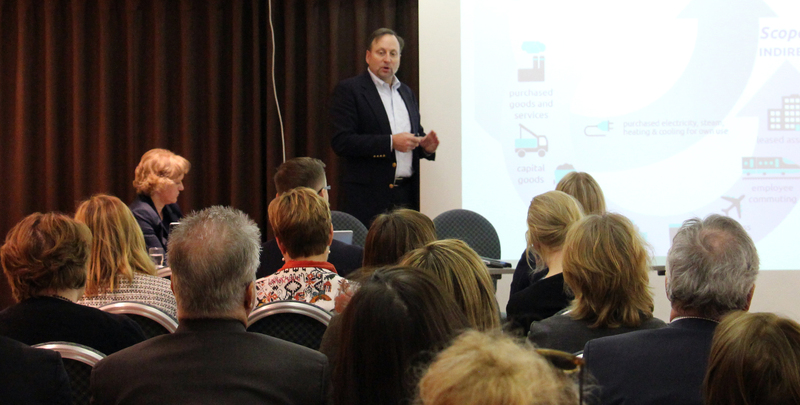 A group of Finnish companies joined Sitra and SYKE to work on the subject. Katriina Alhola is working as Senior Research Scientist at the Finnish Environment Institute (SYKE) on projects related to sustainable consumption and production. What is carbon neutrality and what rules do we need to play by in order to attain it? This question was the starting point when a group of Finnish companies attended a workshop organised by Sitra and the Finnish Environment Institute in Helsinki on 15 April. The Carbon Games event focused on goal setting, procedures, tools and communications. Insights and benchmarks for assessing Finland’s position were provided by a visiting lecturer, Professor Gregory A. Norris from Harvard University. Carbon neutrality has become a more pressing item than ever on companies’ agendas. However, it has a deeper meaning now than in the early 2000s, when the term made its breakthrough as a means for companies to boost their environmental profile and create “green” brands relatively quickly and easily by making use of emission compensation mechanisms. Back then, the symbolic value of carbon neutrality could be a more visible asset than the actual environmental improvement that it entailed. Today, carbon neutrality is primarily a long-term strategic target and goal, to be attained gradually. It contains the promise of being ready to invest and work hard in order to make business activities more sustainable and to build a cleaner future. This is essential for working towards the universal climate target of keeping the global temperature increase below 2°C. However, carbon neutrality plays a key role in how companies communicate with their stakeholders, thus affecting their reputation and success regardless of the fact that the concept’s content has not been fully standardised or a common set of rules has not been agreed on its use. One explanation for why the term has held its status in communications is perhaps because it is easy to communicate and understand – at least on a general level. As a rule, being carbon neutral refers to generating zero net greenhouse gas emissions. In practice, it means that emissions have been reduced significantly but not completely, and that the remaining emissions are offset. No business is emission-free, and carbon neutrality and its various definitions do not specify any quantities on how much of their GHG emissions individual businesses are actually required to cut. However, there are companies in Finland and elsewhere in the world that have made this model work. Their main emphasis is on action aimed at reducing emissions, while compensating emissions remains small-scale, or is only regarded as a temporary tool in a gradual transition towards using renewable energy sources, for example. Finland could have the potential to create an even more broad-based market for emission compensation and carbon offsets – if it wanted to – because the credibility of the concept has not yet experienced the same type of inflation here as it has in the US, where the purchasing of emissions offsets as a generally acceptable means of attaining carbon neutrality is about to reach the end of its road. Emission offsets never really made it big in Finland. A common view of carbon offsets has been that it is short-sighted – that the money would be more wisely spent by companies on practical measures aimed at reducing emissions internally. In addition to measures for improving energy efficiency, many companies these days choose to invest in increasing their own production of renewable energy rather than in carbon offsets. This could also be beneficial to their customers. What started as a process – a path towards carbon neutrality and sustainable business – has now become a strategic tool. The deeper carbon neutrality is embedded into business strategy, the more likely it is to have an impact on the company’s operations as a whole, and perhaps at some level and within a certain time frame, it will also have an impact on the company’s way of doing business and how it positions itself in the “zero carbon world” of the future. Maybe this is the whole point of it all? Namely, that carbon neutrality should be regarded as a goal and source of inspiration, towards which we should strive by following a specifically drawn roadmap. This roadmap will be updated and milestones will take a concrete form along the way. We have to have milestones. They lead us towards our goal, help us see the progress and enable transparent communications. We are living in a period of transition. Finland and other societies are pursuing ambitious emissions reduction targets designed to be in place by 2050. Setting such long-term, concrete targets for emission reductions is difficult for businesses, not least because achieving “real” carbon neutrality also requires system-level changes in society and its various sectors, and such changes can be slow. This has been seen with the transitions to solar economies or bioeconomies. Networking with other companies, or at least setting common goals for each sector, will help individual companies in their goal setting. In Finland, the unwritten rules of how to play the carbon game are openness, transparency, integrity and a long-term approach. The stakes are high; from businesses, this requires putting no less than their profits, products, reputation, efficiency and know-how on the line. From the perspective of efficiency, it is essential to determine the most sensible way of implementing emission reduction measures, and to set a scope and time frame for them. It is also wise to compare the targets to the globally set target levels for emission reductions, which vary by sector. Another key aspect is to identify the products that can be marketed as carbon neutral, and the benefits that these products bring to the customer. The key role of communications in all this is to state the company’s target(s) for pursuing carbon neutrality and the meaning of the concept to the company. Instead of carbon neutrality, companies’ communications are often focused on providing information on the related sustainability or low-carbon measures, because these are easier to measure. Avoiding reputational risks requires honest and open communications based on facts. In the end, it is the whole that counts. A roof full of solar panels may help achieve zero net emissions, but the overall sustainability of a company’s operations is also important. High-quality, durable and energy-efficient products and solutions also help reduce the customers’ emissions, generating a positive impact, i.e. a handprint. Handprinting refers to the calculation of the emissions reductions that can be attained through the company’s solutions elsewhere. A positive handprint is not commensurate with the carbon footprint; it is more of a positive way of communicating the positive impacts of innovative and energy-efficient products and actions. What I remember best from the Carbon Games event is the enthusiasm, knowledge and insights of Finnish companies about the new business models that carbon neutrality can offer, and their positive attitudes towards carbon neutrality as a strategic driver. Carbon neutrality has maintained its credibility in Finland better than in many other countries. In addition to cost savings, the targets and actions aimed at carbon neutrality have provided companies with new knowledge and skills, and have taught them to know their supplier network better. Increased demand has stimulated the development and launch of new products. Understanding the opportunities presented by carbon neutrality has, at its greatest extent, led to the creation of new business concepts. After the Carbon Games event, we organised a workshop for companies. Here are links to the workshop presentations by Katriina and Greg.